Here are some great children’s juicing recipes. I’ve broken them down into 3 different categories; “Healthy Juices” perfect for breakfast and after school. “Juicing Treats” slightly sweeter with a few naughty things like ice cream added, perfect for parties and special occasions. “Smoothies and Shakes”, which provide a great alternative to dessert. Apples, grapes and oranges provide a great starting point as they are all easy to get hold of and the grapes and apples are nice and sweet for their taste buds. A perfect cool drink for those lazy summer afternoons out in the garden. This apple and strawberry combination provides a tantalising naturally sweet juice for kids. Core and chop the apples into rough chunks. Remove the strawberry stalks. 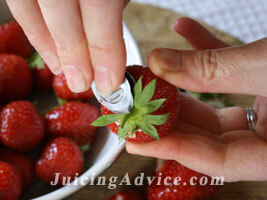 Pass both fruits through your juicer. Add the vanilla and pour over crushed ice. A vibrant layered drink of pure fruit juices providing a great source of vitamin C.
Remove the skin and core of the pineapple and chop into rough chunks. Skin the kiwi fruits and remove the stalks of the strawberries. Put each of the fruits through your blender separately until smooth (keep the juice in separate jugs). Then layer each of the fruits in your glasses starting strawberry then the kiwi and finally the pineapple. As these juicing recipes have naughty things like sugar or ice cream added to them they are best kept as treats such as children’s parties. At least these drinks don’t have added additives so they’ve got to be a better alternative to other commercial fizzy party drinks. An old fashioned lemonade, which is far superior to the commercial variety. Lemons have antibacterial properties and provide support for the liver and kidneys. Finely grate the rind from the lemons and juice the lemons by using a manual or electric citrus juicer. 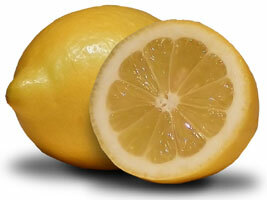 Place the rind of lemons in a large jug, add the sugar and pour over 1 pint of boiling water. Leave to cool. When cool stir in the lemon juice and chill in the refrigerator. Place a scoop of ice cream in each of the glasses. Half fill the glass with the lemon juice, top up with soda water and finally add another scoop of ice cream. Makes 4 large glasses, serve with long spoons! It’s best to make the lollies well in advance and store in the freezer to help yourself to when required. Lolly stirrers also improve kiddie appeal. Remove the core from your apples and skin the kiwis. Start by passing all the apples through your juicer and keep in a separate jug. Next juice the kiwis. Add half the apple juice into some sections of your ice cube tray. Pour the kiwi juice into others. In a food processor whiz the raspberries and add to the remaining apple juice with the sugar. Pour this mixture into the remaining sections in your ice cube tray. Freeze for about 30 minutes. Before it freezes completely push in the lolly sticks and finish freezing. Place all the ingredients into your blender or food processor and whiz. Pour into glasses and serve on a plate with a lolly on the side. Understandably if you place a single piece of fruit on a plate for dessert your children may not give you the greatest response, some refusing to even eat it! However if you serve it up a fruit smoothie or shake of bright coloured layered juice you may just get a more pleasing reaction and an empty glass. Here are a couple of recipes to give you a starting point, see how they go down. I found it a great way to dress up a healthy fruit dessert. I’ve chosen both of these drinks as they produce brightly coloured creations to catch the eyes of little ones. An appealing swirl of mango and raspberry in this fruit packed smoothie. The mango is combined with cow’s milk in this recipe but it works equally well with Soya milk as a healthier alternative. 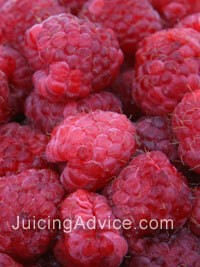 Whiz the raspberries in a blender or food processor until mushy. Add 1 tablespoon of water and the honey to sweeten. Put to one side in a bowl and rinse out your machine. Scoop the flesh from your mango and blend it in your machine until smooth. Add the milk. To create your appealing swirling effect add different layers of each juice into your glasses and then gently mix until you have a pretty pattern! Decorate with raspberries on top. Surely that’s got to be an instant hit with the young ones. Makes at least two glasses. This is a sweet sparkling shake that should appeal to the palettes of children. 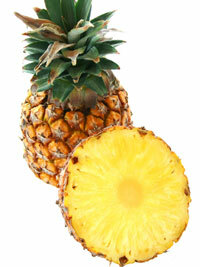 It’s packed full of vitamin C and has a beautiful bright yellow appearance. Remove the skin and core from the pineapple. Chop into rough chunks and whiz in your blender or food processor. Add the grapes and flesh from the mango (having removed the skin and stone) whiz again. Pour into glasses and top up with the desired amount of sparkling mineral water. If you have the time add a straw fruit stick treaded with chunks of pineapple and grapes. 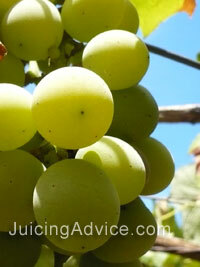 When using children’s juicing recipes always introduce your child to rich pure juice slowly depending on their age. I suggest diluting fresh with water to see how their tummies react to it! 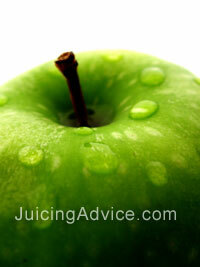 Here are details of more of our juicing recipes.